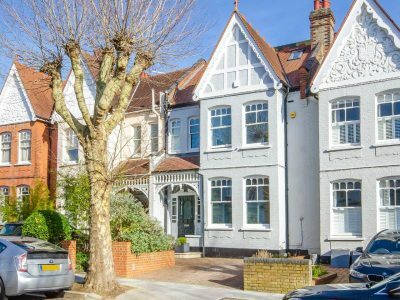 A wonderful double fronted end of terrace family house (Circa 1890) on Crouch End's heights. Convenient for all Broadway and Stroud Green amenities with speedy transport links to town. Impressive space and character with a wealth of original features – high ceilings, cornices, fireplaces, and oak flooring. Late Victorian house featuring two reception rooms opening up to provide a large entertaining area opening through to a conservatory and garden beyond. There is a separate third reception room and a kitchen/diner also opening onto the garden. Diner extension approved – plan available. Lovely wide garden with side access.